Earning a globally recognized advanced security administration and operations certification like the SSCP is a great way to grow your career and better secure your organization’s critical assets. Each presentation is followed by a Q&A period to answer your questions about your certification journey. Registration is required. SSCP certification demonstrates you have the advanced technical skills and knowledge to implement, monitor and administer IT infrastructure using security best practices, policies and procedures established by the cybersecurity experts at (ISC)². Prove your skills, advance your career, and gain the support of a community of cybersecurity leaders here to help you throughout your career. Are you ready to prove yourself? Register and begin your SSCP journey today! NOTE: Join this info-session and earn 1 CPE. It is generally agreed that there are three key pillars of a zero trust approach - Access, Identity and Posture. In previous webinars we have explored how an identity driven approach can be used with a cloud proxy to better secure access to internal applications. In the first part of this webinar we will dive deeper into the third pillar – posture- understand what it means to a user and their devices and see how it can be integrated into a zero trust architecture. The second part will look at the mitigation aspect of posture. We’ll cover the API attack trends – how attacks are moving from web into API with the explosive growth of apps – and the lifecycle of credential fraud. As more organisations deploy cloud apps like Office 365, AWS, and Slack securing corporate data becomes a challenge. While Cloud Access Security Brokers (CASBs) were originally used solely for shadow IT discovery, they have since emerged as the go-to solution for organisations that need end-to-end data security, from cloud to device. In fact, Gartner believes that by 2022, 60% of large enterprises will use a CASB to govern some cloud services. • Case studies on how leading enterprises leverage CASB to secure their cloud footprint. Join Bitglass and (ISC)² on Apr 17, 2019 (Wed) at 11:00 (GMT +8) to learn how a CASB can help you meet your security and compliance requirements. IT automation and orchestration, the key enabler of digitization is the number one IT initiate globally according to our state of application services report 2019. In addition, Zero Trust and Security-By-Design are key imperatives of organizations pursuing digital transformation as these organizations accelerate adoption of cloud technologies to gain speed, scale and accessibility to innovative technologies like AI and blockchains. In this webinar, we will look at the changing landscape of DevOps. We will explore the practice of scaling application security, controlling vulnerabilities and controlling advanced threats with the web application firewall in CI/CD environments. We will also take a look at how the technologies enable close collaboration between security teams and development teams on securing APPs without requiring application teams having in-depth knowledge of security. Join F5 Networks and (ISC)² on Apr 10, 2019 (Wed) at 15:00 (Hong Kong time) to learn about web application firewall in a CI/CD workflow. Go beyond the CISSP and challenge yourself with a CISSP Concentration! Challenge yourself with a CISSP Concentration! These specialized credentials build upon the CISSP. Whether you’re interested in career growth, deeper knowledge or achieving elite status, CISSP Concentrations prove your subject matter mastery. Got questions on the certifications? We have the answers. Are you ready to prove yourself? Register and begin your journey today! NOTE: This info-session is meant for CISSP credential holders only. Join this info-session and earn 1 CPE. This certification proves your expertise developing, designing and analyzing security solutions. It also shows you excel at giving risk-based guidance to senior management in order to meet organizational goals. This certification recognizes your keen ability to practically apply systems engineering principles and processes to develop secure systems. You have the knowledge and skills to incorporate security into projects, applications, business processes and all information systems. This certification shows you excel at establishing, presenting and governing information security programs. You also demonstrate deep management and leadership skills whether you’re leading incident handling and/or a breach mitigation team. Identifying malicious bots and safeguarding against them is a top priority for organisations developing a sustainable security strategy. Join F5 Networks and (ISC)² on Apr 3, 2019 (Wed) at 14:00 (GMT +8) to learn how to fight against the malicious bots. 사용자 ID는 보안 및 생산성과 관련되어 있는 기업 보안의 핵심 요소입니다. 이 웨비나에서는 기업을 내부 및 외부적으로 보호하려면 ID를 어떻게 관리해야 하는지에 대해 중점적으로 다룰 예정입니다. • 이전에는 제로 트러스트 아키텍처의 개념에 대해 살펴봤습니다. 제로 트러스트 네트워크를 구축하는 많은 방법 중의 하나는 바로 IAP(Identity Aware Proxy)입니다. 웨비나의 전반부에는 네트워크가 아닌 애플리케이션 레이어에서 ID와 접속 룰을 적용하고 최소 접속 권한을 제공하는 IAP의 모범 사례에 대해 중점적으로 알아봅니다. • 후반부에는 아시아∙태평양∙일본 지역에서 증가하고 있는 크리덴셜 스터핑 활동에 대해 설명합니다. 크리덴셜 스터핑의 근본 원인, 경제적 손실, 공격자들이 사용하는 방법, 봇넷을 통한 자동화에 대해 중점적으로 살펴봅니다. 또한 봇넷 리스크를 성공적으로 차단하기 위해 여러 분야의 기업들이 도입한 솔루션에 대해 소개하는 사례 연구도 언급할 예정입니다. NGFWs, IDS, sandboxes, DLP, etc are important - but increasingly, DNS is a major security weakness, allowing hackers to exfiltrate & infiltrate confidential data. This is a known issue because DNS was initially designed very simple and this attracts hackers to abuse the protocol. How do we protect our internal data and prevent hacker attacking the service? Join Infoblox and (ISC)² on Mar 20, 2019 (Wed) at 14:00 (GMT +8) to learn the best practices in securing DNS. Earning the globally recognized CCSP cloud security certification is a proven way to build your career and better secure critical assets in the cloud. The CCSP shows you have the advanced technical skills and knowledge to design, manage and secure data, applications and infrastructure in the cloud using best practices, policies and procedures established by the cybersecurity experts at (ISC)². Prove your skills, advance your career, and gain support from a community of cybersecurity leaders here to help you throughout your professional journey. Are you ready to prove yourself? Register and begin your CCSP journey today! Cyber hacks of major corporate systems and websites continued apace and will inevitably be part of the 2019 cybersecurity scene. Many well-known organizations across the globe suffered significant breaches. Beyond all-too-common corporate attacks, 2018 was also marked by accelerated threat activity across a diverse range of targets and victims. Staying ahead of the evolving threat landscape requires an easy to implement endpoint security framework and simplified, yet powerful, security tools to protect against emerging threats. New techniques have vastly improved response to evolving attacks. Advanced Endpoint Security explains how these technologies work and sets forth an integrated framework for endpoint security that covers it all. Join Symantec and (ISC)² on Mar 6, 2019 (Wed) at 15:00 (Hong Kong time) to explore the cybersecurity predictions and advanced technology on endpoint protection. *This webinar will be conducted in Cantonese. • Enhance your enterprise security perimeter and reduce your attack surface, minimizing the chance of an attack. Picking up from our previous webinar, we’ll do a deep dive on Identity Aware Proxies and examine how their architecture helps improve your security posture. Join Akamai Technologies and (ISC)² on Mar 6, 2019 (Wed) at 13:00 (GMT +8) to learn how to decode identity aware proxies. Accelerate your cybersecurity career with the CISSP certification. 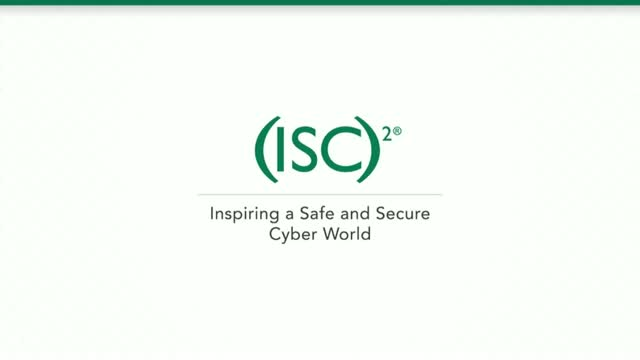 Join this online info-session hosted by (ISC)² and learn everything you need to know about the globally recognized credential CISSP! Earning the CISSP proves you have what it takes to effectively design, implement and manage a best-in-class cybersecurity program. With a CISSP, you validate your expertise and become an (ISC)² member, unlocking a broad array of exclusive resources, educational tools, and peer-to-peer networking opportunities. Prove your skills, advance your career, and gain the support of a community of cybersecurity leaders here to support you throughout your career. Earning the globally recognized CSSLP secure software development certification is a proven way to build your career and better incorporate security practices into each phase of the software development lifecycle (SDLC). CSSLP certification recognizes leading application security skills. It shows employers and peers you have the advanced technical skills and knowledge necessary for authentication, authorization and auditing throughout the SDLC using best practices, policies and procedures established by the cybersecurity experts at (ISC)². Are you ready to prove yourself? Register and begin your CSSLP journey today! Most organisations have multiple products and services, from multiple vendors and suppliers to address their cybersecurity needs. The lack of integration and inability to share critical information results in silos of technology that cause inefficiency, lack of agility, limited visibility and a poor security posture. How can an organization solve and streamline to improve their cybersecurity operations? Join Infoblox and (ISC)² on Feb 20, 2019 (Wed) at 14:00 (GMT +8) to learn how to assist organisations in improving their security operations and reducing time to containment. As an (ISC)² Member, you now have access to a wide range of global resources, educational tools, peer networking opportunities, as well as exclusive discounts to industry events. There is so much more to discover to what your (ISC)² membership brings! - The latest news and developments across APAC and (ISC)² from around the world. - New, upcoming and FREE professionally developed education courses just for members. - An update on (ISC)² certifications to help you take your career to the next level. Join us on Feb 12, 2019 (Tue) at 14:00 (GMT +8) to get the most of your (ISC)² membership globally and locally. Today, every organization faces vulnerability overload. In 2018 alone, Tenable Research estimates nearly 19,000 new vulnerabilities will be disclosed. There are just too many to discover, assess and effectively mitigate. Reducing vulnerability overload means focusing like a laser on vulnerabilities most likely to impact your business right now. To learn how you can address this challenge, join Robert Healey, APAC Marketing Director with Tenable and (ISC)² at 14:00 (Singapore Time) on Jan 30, 2019 (Wed), for a webinar exploring best practices you can adopt to overcome vulnerability overload and better protect your business from cyber risk. Looking for expertise and information to advance your career and tackle your challenges? Subscribe and join us for the educational webinars in APAC time zone. Earn CPEs quickly and at no cost by attending webinars: 1 hour of webinar equals 1 CPE. We welcome members and non members alike.